Training: As a follow-up for a one-day sales-training seminar, mixed-reality technologies deliver reminders to participants on their cellphones. And daily suggestions on how to integrate what they've learned into their work lives. Promotion: Promote a product by sending polls, questions, suggestions to your prospects. Based on their reactions, send information on new products they might like. Focus group follow-up: Continue interacting with focus group participants by asking them what they like, or suggesting things for them to look for each day. Fun: Create real-world games where participants find their clues in the cityscape, and interact by calling in for phone messages that take them to new places. 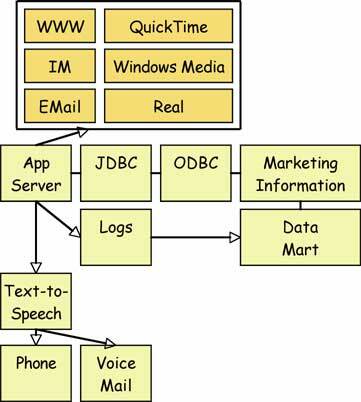 A scenario is created for each application. For example, a company which needs to train new salespeople to use a sales-lead-tracking system could utilize a scenario that sends each salesperson new “leads”—these leads would be integrated into the regular lead flow coming to each salesperson. They require that the salesperson follow up the “hot” leads quickly, focusing on those with most promise, and the system can not only create these leads, but measure follow-up times and score each salesperson on their performance. 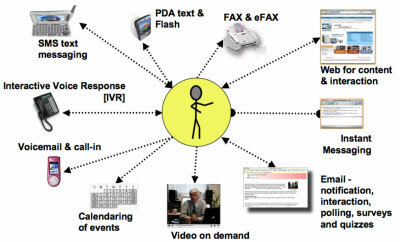 Each scenario may contain emails, video (presented online on the salesperson's computer), intranet and other web sites, phone messages, wireless text (SMS-to cellphones or PDAs), and simulated voicemail. These scenarios are implemented as sets of states and rules. A participant will always be in a single "state" within the scenario, and the system is paying attention to everything the participant does that's pertinent to that state. It may be sending an email from an in-game "character" to a participant, or waiting for the participant's response to that email. The scenario may have several timers set - and when one expires it may send a reminder to the participant. It examines each incoming email from each participant, and analyzes it against the rules for the current state of the scenario. Mixed-reality technologies are built on modern web-application "layered" technologies. And they're built on technologies which work well together - ODBC databases (MySQL, SQLServer, Oracle), web servers (Apache and IIS), Java servlets, POP3 and SMTP email, and audio and video servers (QuickTime, Windows Media and Real). Because they're designed to interoperable standards, parts can be interchanged, scaled up in size or replaced as needed to handle capacity issues. And license fees for supporting software are lowyou don't get locked in to expensive proprietary solutions to your software needs. These technologies are very expandable (scalable) and whole scenarios can be duplicated to reduce the expense of additional implementations for new products, lines or companies. A scenario which has been tested, and found to work with customers can be duplicated with new "content" to become a new Mixed-reality technology application.